Below, please find the text version of the Kryptos code. If you would like to test your code-cracking skills, view the panels as they appear on the sculpture. The text alignment on the panels is a vital part of solving the puzzle. To achieve the goal of acquiring fitting artwork for NHB, the CIA Fine Arts Commission recommended that the Agency utilize the services of the Art-in-Architecture program of the General Services Administration (GSA). This is a Federal program which has managed the creation of contemporary art for Government buildings for more than 25 years and which has resulted in highly acclaimed works. GSA formed a team composed of experts led by the National Endowment for the Arts and members of the CIA Fine Arts Commission and other Agency employees. "People are the principal resource of the Central Intelligence Agency. It is their intellectual and physical energies that ultimately provide the national policymakers with superior information and analyses---the basis to formulate policies necessary to maintain this country’s position in the world. An esthetically pleasing work environment at its Headquarters is an important stimulus to the efforts of those officers assigned here." These principles were the guidelines that artists followed as they competed for the $250,000 commission to design artwork for the New Headquarters Building. The combined NEA and CIA panel evaluated each entry and, in November 1988, chose local artist James Sanborn’s conception of "Kryptos" (Greek for "hidden"), a two-part sculpture located at the main entrance to NHB and in the courtyard between NHB and the Original Headquarters Building (OHB) cafeteria. In the courtyard, a calm, reflective pool of water lies between two layered slabs of granite and tall grasses. Directly across from this is the centerpiece of "Kryptos," a piece of petrified wood supporting an S-shaped copper screen surrounding a bubbling pool of water. The copperplate screen has exactly 1,735 alphabetic letters cut into it. 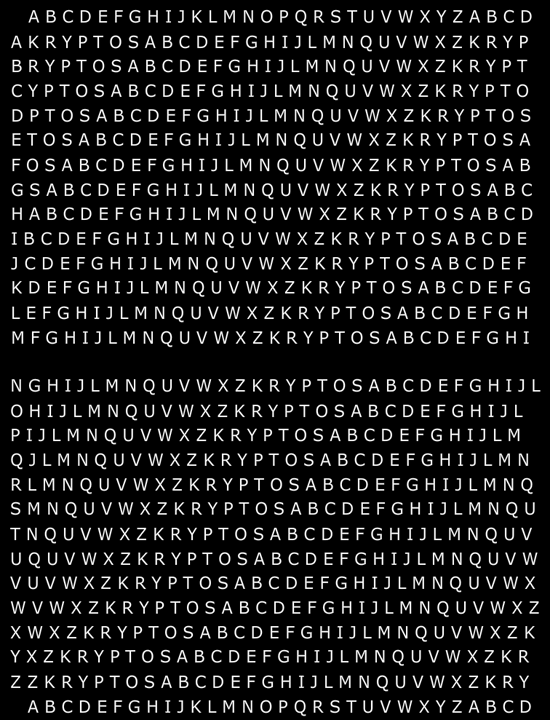 In addition to its purely aesthetic qualities, Kryptos contains codes that are important to the history of cryptography. When we stand in the CIA courtyard and look at Kryptos from the front, the petrified tree is to the left of the copper screen. From this vantage point the left half of the copper screen is the encoded text and the right half of the copper screen is a series of alphabets, one above the other and is a "chart" called Vigeneries Tableaux developed by 16th century French cryptographer Blaise de Vigenere. In Kryptos this chart has been intentionally flipped so it can only be read from the back of the sculpture. The artist used this "chart" system, in combination with matrix coding systems, to encipher the first three encoded texts on the left side of the screen. The artist designed the fourth section (now referred to as K4) to be very difficult to crack and as of yet, it has not been broken. James Sanborn once said "They will be able to read what I wrote, but what I wrote is a mystery itself." 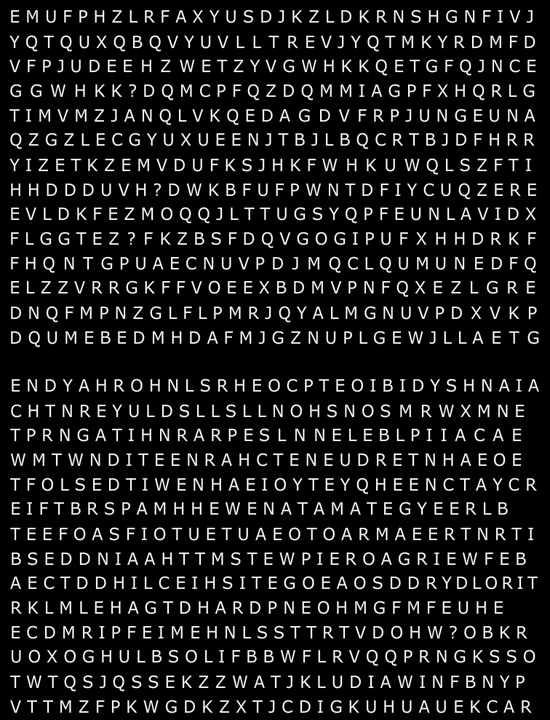 Only time will tell if the final message to this multi-layered puzzle is ever revealed. James Sanborn is a Washington, D.C.-born artist with a Bachelor of Arts degree from Randolph-Macon College and a Master of Fine Arts from Pratt Institute. Mr. Sanborn is noted for his work with American stone and related materials that evoke a sense of mystery and the forces of nature. To give shape to "Kryptos," Sanborn chose polished red granite, quartz, copperplate, lodestone, and petrified wood. After reading extensively on the subject of intelligence and cryptography, Mr. Sanborn decided to interpret the subject in terms of how information is accrued throughout the ages. In the case of the two-part sculpture, information is symbolized in the chemical and physical effects that produced the materials and in other more literal ways. To produce the code for "Kryptos," Mr. Sanborn worked for four months with a retired CIA cryptographer to devise the codes used in the sculpture. Mr. Sanborn wrote the text to be coded in collaboration with a prominent fiction writer.